Americans, it's not a problem for us. This time around, American muscle is being exported. The new Ford Mustang was designed from the get-go to be a world car. The same goes for the recently revealed 2016 Chevrolet Camaro. Both have state-of-the-art rear-wheel-drive platforms. Both offer a range of engines, from turbo four bangers to a naturally aspirated V8s. However, the mid-range V6 engine in both cars that’s standard fare for America doesn’t have the same status abroad. Like the Mustang’s 3.7-liter V6, the new Camaro’s 3.6-liter V6 won’t be on offer in Europe. 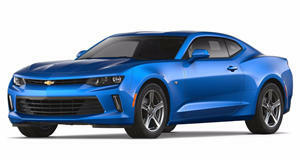 Instead, European Camaro buyers will have a choice of two engines: the 2.0-liter turbo four or the 6.2-liter LT1 V8. Chevy and Ford obviously don’t see naturally aspirated V6s as part of Europe’s future. Oh well, at least the V8s are happening. Expect the new Camaro to go on sale in Europe only a few months after it arrives in US dealerships sometime this fall.